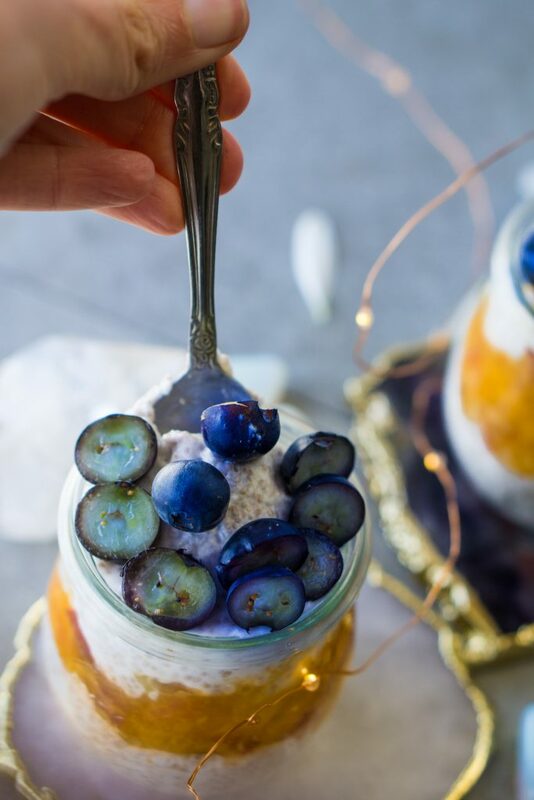 Coconut Yogurt Chia Pudding with Peach Compote and Blueberries (vegan, paleo, & keto) is the perfect recipe for when you are running out the door or even traveling somewhere. Right now we are in Wisconsin visiting family and this has been my go-to breakfast recipe. It is so quick to make and all I do is pack chia seeds, and buy coconut yogurt and blueberries at the local grocery store. 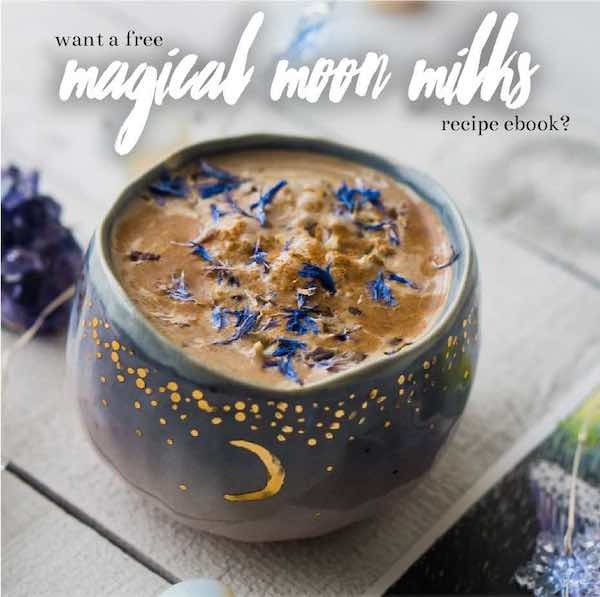 When I am making this recipe at home I’ll add in more fruit and other fun adaptogens like blue spirulina and magical mushrooms. While traveling for me it can be hard to get in my daily fruits, fats, and fiber. I am happy to say this recipe fixes all of that. Also when I am home I used the blueberries and peaches from my Imperfect Produce box (when you click this link you get $10 off your first box) which is a really sweet deal and company that you can order from and they send you the perfectly imperfect product that usually gets thrown away if a store doesn’t buy it. I’ve been apart of this program for over a year now and absolutely love it. This is not a sponsored post just me sharing the love. 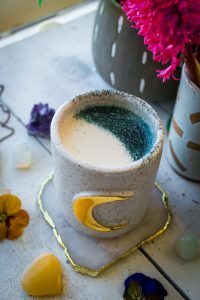 Researchers from Mexico uncovered that chia seeds had a total natural phenolic (antioxidants) concentration nearly two times higher than previously reported, and the antioxidant activity was shown to stop up to 70 percent of the free radical activity. Chia is super-high in fiber, providing nearly 11 grams per ounce. One serving can provide the recommended fiber intake for the day, according to the American Dietetic Association. 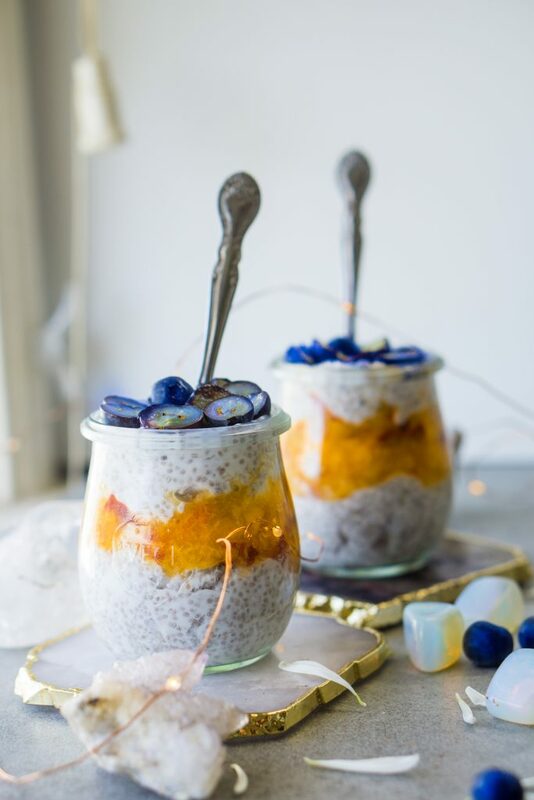 Chia seeds’ ability to reverse inflammation, regulate cholesterol and lower blood pressure makes it extremely beneficial to consume for heart health. Also, by reversing oxidative stress, someone is less likely to develop atherosclerosis when he or she regularly consume chia seeds. 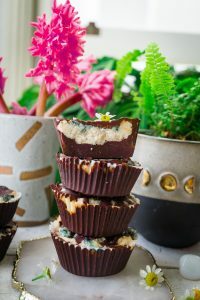 Because chia seeds are rich in alpha-linolenic acid and fiber, researchers from the University of Litoral in Argentina set out to determine how chia seeds can help prevent metabolic disorders like dyslipidemia (excessive fat in the blood) and insulin resistance, which are two factors in the development of diabetes. 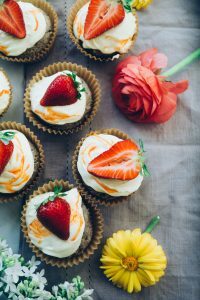 A study published in the Journal of Strength and Conditioning concluded that consuming chia seeds enhanced exercise performance for workouts that lasted 90 minutes the same way a sugar-laden sports drink would, but without all the unhealthy sugar. Just one ounce of chia seeds has about 18 percent of the recommended daily amount of calcium. Calcium is fundamental in bone health and helps maintain bone strength and mass. Chia seeds also rank among the top plant-based sources of protein. This is another reason this super seed is great to consume for those trying to put on lean muscle, burn fat and balance blood sugar levels. Chia seeds are rich in alpha lipoid acid, which is an omega-3 fatty acid. In 2013, the Journal of Molecular Biochemistry found that ALA limited the growth of cancer cells in both breast and cervical cancers. With chia seeds packed with calcium, phosphorus, vitamin A and zinc, it’s no wonder that they’re a top food to help your teeth. Calcium is the building block of your teeth and necessary for tooth health. Zinc prevents tartar by keeping plaque from mineralizing onto your teeth and has an antibacterial effect that keeps bad breath germs away. Vitamin A and phosphorus are also important for strong teeth and a healthy mouth. In a medium-sized bowl mix your coconut yogurt and chia seeds together. Make sure to mix very well. Let sit for 10-20 minutes while your chia seeds soak into the coconut yogurt. In the meantime wash and mash your peaches, I put mine into a food processor to get jam-like. 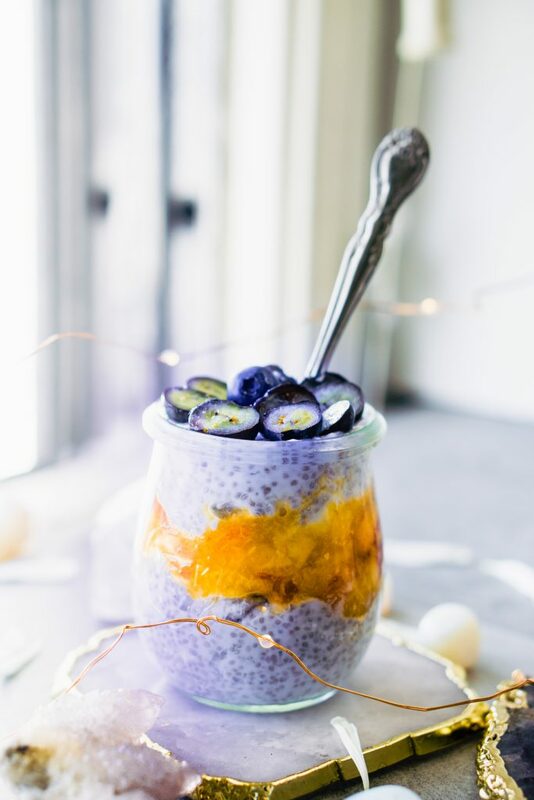 Once the chia pudding is complete, grab two jars and layer your chia pudding, peach compost and the top layer is sliced blueberries or any berries you have on hand.